The most durable, flexible, high quality fibers available. The SMH-series fibers have been designed to mate perfectly with the Odyssey 30 laser system. When an SMH fiber is connected to the Odyssey, the system automatically detects the fiber type and modulates the power accordingly. SMH fiber assemblies can also be used with most SMA-905 compatible holmium and Nd:YAG lasers. All SMH fibers can be re-used with proper handling. This means that you may re-process and re-sterilize the entire fiber assembly using either ethylene Oxide (EtO), Sterrad (H2O2) or autoclaving protocols. The CMH-FL series fibers have been designed to work perfectly with the new Odyssey 30 laser system. To keep the CMH fiber prices competitive and maintain control the quality, the fibers are designed to be used with the Lifetime Use Program, where you may return your fibers to Convergent for factory reconditioning. Without this program, your facility has one of two options. 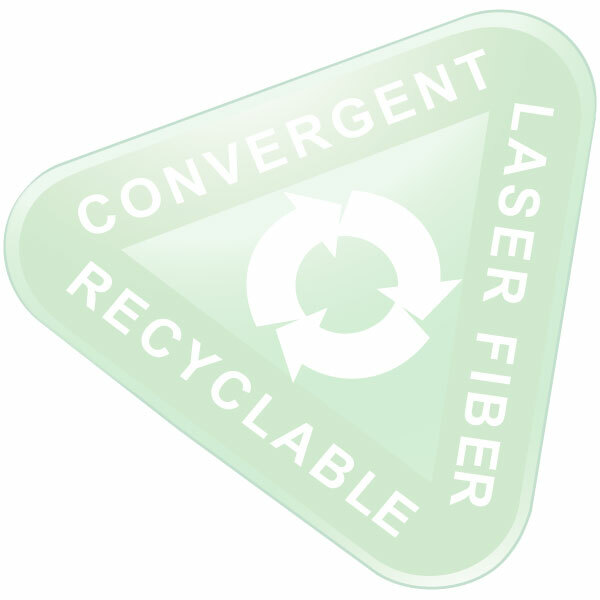 The most common option is to recycle laser fibers on-site. This requires cutting and cleaving the distal tip and then resterilizing the entire assembly. On-site recycling requires your staff to establish and maintain a specialized fiber handling protocol. Incorrect fiber handling can cause damage to the delicate fibers. The second option is to use a new fiber for every case, thereby ensuring fiber reliability. The first option, if executed properly offers the greatest potential cost savings. While the second option offers a higher, but fixed, cost per case. Our Fiber Recycling Program offers a better alternative to help you manage your costs and still have the use of consistent and reliable products. Instead of recycling your fibers at your facility or disposing of the fibers after each use, you send the used fibers back to our Fiber Recycling Department. We will clean, inspect, repair or replace parts, re-package, and resterilize the fiber. In about two weeks, you will receive the recycled fibers back in like-new condition. The CLT-FL series fibers have been designed to be compatible with the T-1470 ProTouch and T-1470 LiteTouch laser systems. To keep the CLT-FL fiber prices competitive and maintain control of the quality, the fibers are designed to be used with the Lifetime Use Program, where you may return your fibers to Convergent for factory reconditioning. Under this program, customer returns the used fiberoptics to Convergent. In 2-3 business days, you will receive “like new” factory reconditioned fibers, sterile and ready for patient use. This program is easy to manage and guarantees substantial savings for consistent supply of high quality Convergent fiberoptics. Each laser system uses a flexible fiber-optic delivery system ("fiber") to deliver both the working laser energy and the green visible aiming beam. The fiber delivery system is typically used in conjunction with a rigid or flexible endoscope to access the surgical site. Fiber optics work on the principle of total internal reflection. Laser energy is focused into a glass silica fiber at the proximal end and traverses the length of the fiber by means of total internal reflection. The fiber is able to contain the laser beam and funnels the laser energy from the proximal end to the distal end with less than 1% energy loss per meter. Laser fibers are made up of four different layers. The silica core (blue) is the channel that transmits the laser energy. The core is wrapped with a very thin cladding layer (orange) that increases the strength of the fiber, adding to its flexibility. The next layer is the coating (green) which protects the fiber during the stripping process. The outermost layer is the buffer. The buffer (purple) is made of a softer material that protects the fiber from rough handling. Fibers are delicate optical instruments and should be handled with care. The typical fiber has a core diameter approximately five times the width of a human hair. Observe the following precautions when handling fibers. Do not bend fibers to a diameter of less than six inches (15 cm). Keep the connector dry and free from contaminants. Any soiling or scratches on the surface of the proximal end can cause damage when laser energy is applied. Do not use a damaged fiber. Inspect the fiber's proximal end and verify its transmission before each use. Replace the dust cap on the proximal end of the fiber upon removal from the laser aperture. Do not over-tighten the connector onto the laser aperture. Do not place sharp objects on or near fibers. This prevents mechanical damage. The distal end of a fiber is sharp and can puncture or damage tissue and material. To protect from damaging flexible endoscopes, never extend or retract the distal end of a fiber past the end of the working channel while the endoscope is deflected. Likewise, when deflecting the endoscope with the fiber exposed be careful not to scratch or puncture tissue. While lasing, the distal tip should be in "near-contact" with the target tissue or calculi. Contacting the fiber to the target tissue will degrade the fiber tip and reduce the effectiveness of the laser. Understand that energy density depends heavily on the fiber core size. For the same power setting, a 200 micron fiber delivers four times the energy density of a 400 micron fiber. The proximal end of the fiber is the point at which laser energy is focused into the fiberoptic. The focal point contains extremely high energy densities. Therefore, any debris or oils on the proximal end will cause the focused laser energy to damage the connector. A damaged connector, if it continues to be used, may damage the internal optics of the laser system. Prior to using a fiber, inspect the proximal end for obvious signs of damage. Using a fiber inspection microscope, view and compare the magnified image to the following graphics. NOTE: If a fiber has been damaged, the blast shield in the laser system should be immediately rotated to the next clean position. 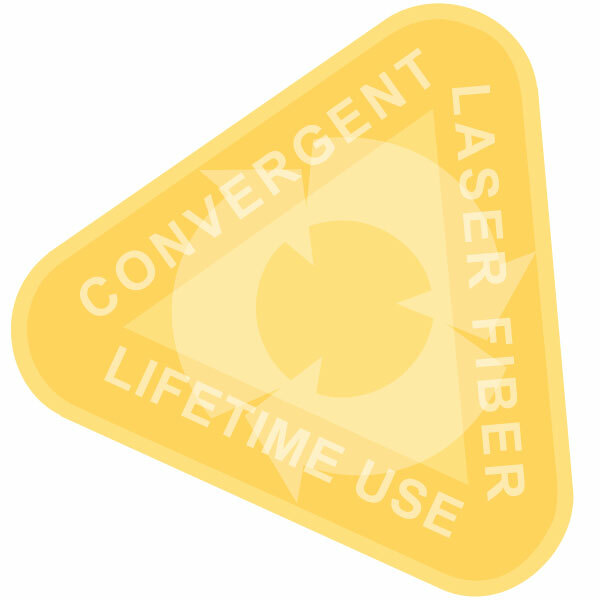 Chipped, cracked or broken fibers may cause harmful laser energy to "leak" from the fiber optics. Fortunately, these problems can be easily identified by using a fiber inspection microscope. Attach the fiber connector onto the fiber inspection microscope. Turn on the microscope light source. Point the distal tip of the fiber to a bright light source such as an overhead light or sunlight. Compare the magnified image with the graphics below. Q In how many procedures can I reuse an SMH fiber? Type of fiber—larger core fibers can last up to 50 cases while smaller core fibers will last between 1 and 10 cases. Handling—the proximal end of a fiber is very sensitive to dust, oils and moisture. Improper handling can damage a fiber immediately. Type of procedure—the total energy delivered is a better metric to judge the life of a fiber. Larger core fibers can withstand 30,000 J while the limit on smaller core fibers is closer to 3,000 J.
Q What are the benefits of your fiber recycling program? A You will receive ready-to-use sterile fibers without the high cost of purchasing new fibers each time and without the hassle of recycling the fibers yourself. Q Which sterilization protocols are compatible with your SMH holmium laser fibers? A You can sterilize SMH fibers using either ethylene oxide (EtO), STERRAD, or steam. Q Can I use a 3rd-party fiber with the Odyssey 30? A The SMH connector fibers have built-in safety controls to extend the useful life of the fiber. Currently, no 3rd-party is qualified to supply compatible fiber assemblies.